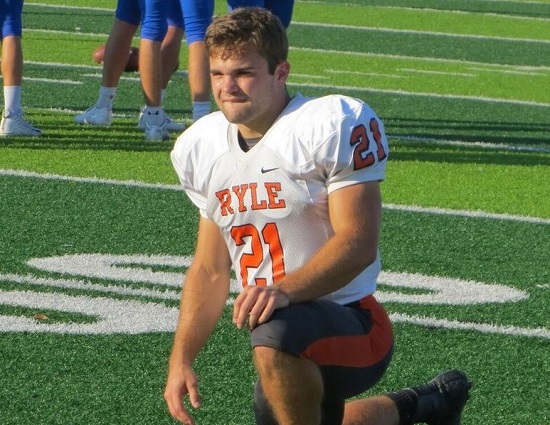 Ryle RB Jake Chisolm and Covington Catholic seniors – QB AJ Myer and LB Kam Butler were named First Team All-Kentucky. Here is the Louisville Courier Journal 2017 Kentucky All-State high school football team, as voted on by the state’s coaches. Quarterbacks: Beau Allen, Lexington Catholic; Justin Blackburn, Ludlow; Nick Bohn, Trinity; Joey Cambron, Daviess County; Josh Davis, Scott County; Cameron Jones, Knott County Central; J.R. Lucas, Collins; Ty Mink, Monroe County; Camron Sizemore, Corbin. Running Backs: Bryson Cobb, LaRue County; Charles Collins, Montgomery County; Alex Dowds, Campbell County; Blake Franklin, Anderson County; Brice Fryman, Scott County; Blake Gamble, Johnson Central; Seth Johnson, Shelby Valley; Dameon Jones, Lexington Catholic; Diion Leavell, Christian County; Landan Swartz, Bath County; Ethan Varney, Prestonsburg; Dillon Wheatley, Lexington Christian. Wide Receivers/Tight Ends: Drew Cox, Ballard Memorial; Demontae Crumes, Butler; Ethan Dossett, Crittenden County; Jacob Lightfoot, Allen County-Scottsville; Sincere McMurry, Moore; Britt Pendleton, Casey County; Nelson Perrin, Scott; Peyton Peters, Apollo; Malachi Pike, Covington Catholic; Stetson Simpson, Wayne County; J.P. Vaught, Southwestern; Nick Veneman, Highlands. Offensive Linemen: Parker Bisek, Ryle; Carter Black, Covington Catholic; Peyton Blackburn, Shelby Valley; Jackson Burke, Owensboro; Austin Campbell, Casey County; Michael Dunn, Highlands; Chase Farris, St. Xavier; Blake Hammonds, Madison Central; Ben Jackson, Clark County; Devin Jeffries, Mayfield; Peyton Knippenberg, Conner; Christian Lawson, Graves County; Matt Mellencamp, Warren East; Dylan Miller, Male; Matthew Napier, East Jessamine; Dagen Rash, Belfry; Dalton Tucker, Bourbon County; Seth Turner, Floyd Central; Kairus Washington, Dixie Heights. Kickers: Adam Barry, North Oldham; Nick Kopp, Manual; Sebastian Mata, Trinity; Boyce Nichols, Caldwell County; Analu Rugerio, North Hardin. Defensive Linemen: Pereon Allen, Pleasure Ridge Park; Cody Auxier, Trinity; Cole Baker, Caldwell County; Shae Carwile, Daviess County; Daillis Cox, LaRue County; Adam Derry, Beechwood; DeOnta Duncan, Central Hardin; Jimmy Edmonds, Ballard; Collin Hartmann, Somerset; Kade Holland, Hazard; Scott Humpich, Eastern; Devan Jackson, Bowling Green; Qualio King, Union County; Payton Leneave, Christian County; Michael Mayer, Covington Catholic; Octavious Oxendine, North Hardin; Dion Pearson, Franklin-Simpson; Zach Ramey, East Ridge; Dawson Stalker, Johnson Central; J.J. Weaver, Moore; Josh Williams, Southwestern. Linebackers: Will Cox, Paris; Pete Cross, South Warren; Grant Dyer, Covington Catholic; Nick Eades, Collins; Shamar Foster, Christian County; Don Harris, Danville; Tykeise Henry, Mason County; Tucker Holland, Knox Central; Ethan Hull, Trinity; Devin Johnson, Johnson Central; Shawn’Kel Knight-Goff, Doss; Rasean McCauley, Male; Ean Shaw, Lafayette; Eythan Sims, Corbin; Hunter VanHooser, Caldwell County; Jacob Woolum, Perry County Central. Defensive Backs: Devonte Cubit, Campbellsville; Damon Durrah, Fern Creek; Marcis Floyd, Manual; Marshon Ford, Ballard; Ramond Jackson, Henry Clay; Trevon Jones, Clark County; Mason Miller, Russell County; Jameer Riley, Caldwell County; Javaren Robey, Russellville; Tavian Starks, North Hardin; Brayden Trattles, Simon Kenton; Devin Varney, Belfry; David Walker, Danville; Braxton Whitaker, Hazard; Storm Wilson, East Jessamine. Punters: Grayson Cook, Belfry; Skyler Mayes, McCracken County; Kyle Nalley, St. Xavier; Brayden Oberhausen, Fern Creek; Matt Shearer, Simon Kenton.